Yaaaaaay! I ripped this recipe out of a magazine and have been looking at it for a few months. I finally made it, and am so glad I did. 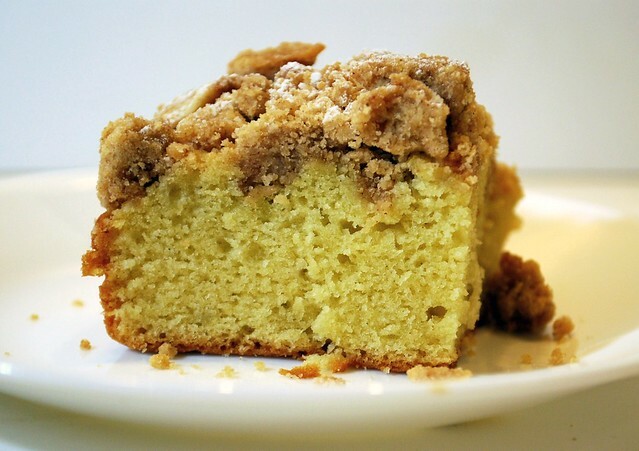 Back in high school, I used to go to this deli and get sandwiches and coffee cake, and this is pretty close to the coffee cake that I used to love. Hooray! The cake is soft and moist and buttery, and the crumb top is sweet and crunchy and slightly cinnamon-ny. Mix together butter, sugars, cinnamon and salt together, then stir in the flour and xanthan gum. Set aside to cool and harden a bit. Preheat oven to 325. Line an 8x8 pan with foil and spray with cooking spray. Whisk the flour, xanthan gum, sugar, baking soda, and salt together in the bowl of a mixer. Add the butter, one slice at a time until mostly incorporated. Add in the yogurt, eggs, and vanilla and beat on medium-high until batter is light and fluffy. Scrape into the pan, and smooth the top with a spatula. Break up the crumb mixture with a fork, leaving as many pieces that are about the size of a dime as you can. Spread the crumb mixture over the top of the cake, and bake for 40-45 minutes on the shelf on the top third of the oven. Cool on a wire rack. Makes about 9 servings. Oh YUM! 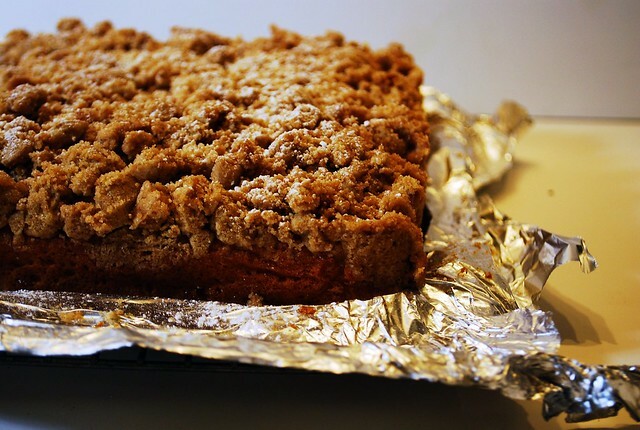 Looks like you nailed that one, picture perfect coffee cake! I'm making that for this weekend. This looks divine! 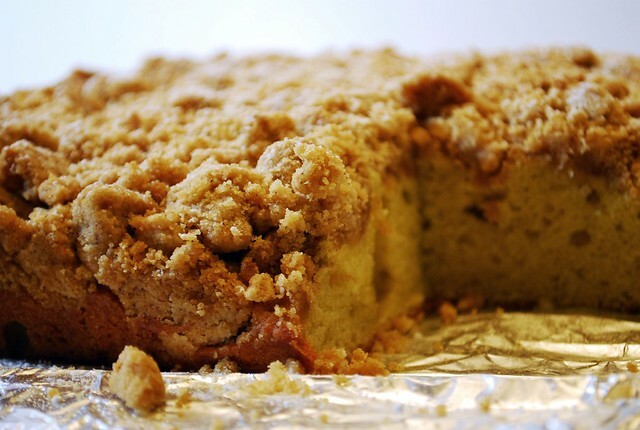 Although, I confess that my favorite part of the crumb cake is the crumb, not the cake. I wonder if it would hold together if I doubled the crumb part. What would you call that? Texas Style New York Style Crumb Cake?! MMMMMMMM,...What a divine & stylish looking cake!! yum! can't wait to try this!! I love the variety of your recipes, so I nominated you for a blog award - Versatile Blogger Award! Oh this looks amazing...perfect recipe for my Spring Break week. Thanks! I have piles of recipes ripped out of magazines to try later and convert to GFree. What a lovely looking cake, I love that crumb topping! Will this work with no dairy butter substitute? This sounds amazing!! Thank you so much for sharing. I am also dairy free, so this is perfect with a butter substitute. My cake batter is far from light & fluffy. It's like a thick ball of dough... I think next time I will try to mix the ingredients a little differently... for example - cream the butter & sugar together, then incorporate the eggs, then the yogurt & then add the dry ingredients which have been mixed together. I'll see if it comes out better that way next time. I have no clue what could be wrong, I followed the recipe to a T.
Also, the recipe makes a lot of crumbs. I recall someone asking about doubling the crumb part. I will let you know how they held up once it's out of the oven. My batter was very thick, not at all "light and fluffy" and turned out really dense. And my crumbs did not work at all! I did everything as it said to, but still it didn't work. Next time I would suggest more moisture. My mom really liked it though.